A sailboat passes the skyscrapers of downtown San Diego on a Sunday afternoon. The Star of India, a tall ship that sets sail a couple of times each year, is visible at its dock behind the moving sailboat. Photo taken 06/14/09. A San Diego Trolley red car curves toward San Diego State University near College Avenue and Alvarado Road. Photo taken 01/24/09. 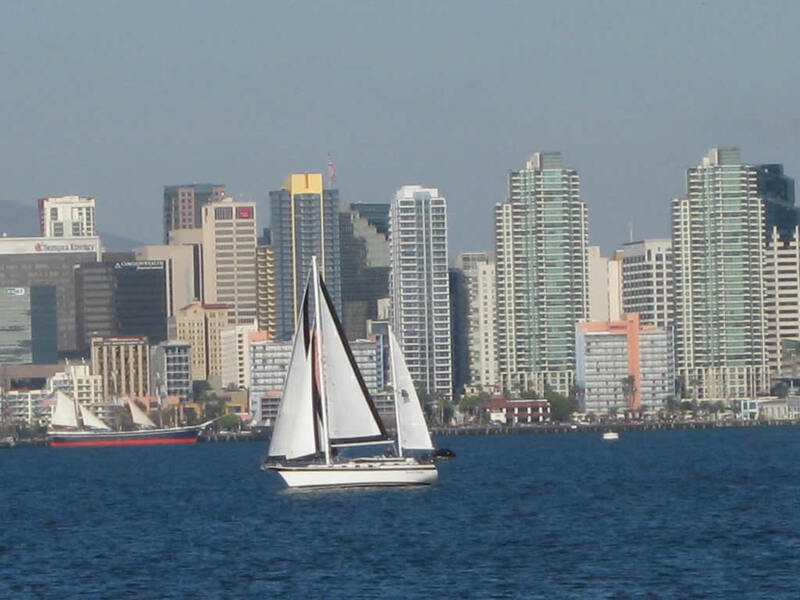 America’s Finest City, San Diego, is the seventh largest city in the country per the 2000 census; it has since dropped to the eighth largest city. Well-known as a military town, San Diego’s economy is diversified, from defense contracting to the high-tech, biotech, and tourism-based economies. With its many days of sun and relatively few days of rain, San Diego’s climate is often viewed as among the best in the country, with a minimal number of thunderstorms each year. Nighttime costal low clouds and fog is commonplace, as the ocean moderates daytime temperatures. A growing Southern California city, San Diego has expanded dramatically as its economy continues to grow and more people move into the area from around the country. Many people living in San Diego preface their conversations, “So, where are you from?” because so many have immigrated to this region. Some have bumper stickers that declare themselves natives after a year’s stay in San Diego. 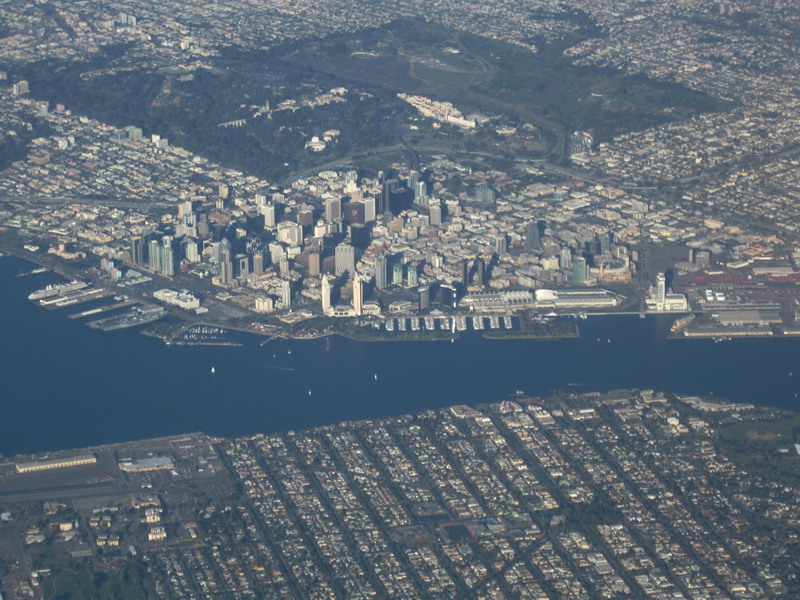 However, as more traditional industries take hold in addition to the transient military population, the city of San Diego is growing into its own reputation, separate from its large neighbor to the north. 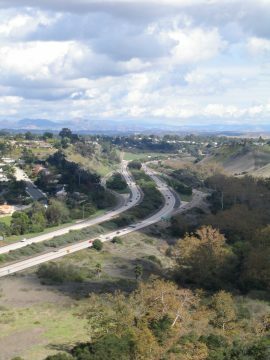 Having one of the most fully developed freeway systems of any urban area in the state, San Diegans are fortunate to have six north-south freeway routes along the Interstate 8 corridor and six east-west freeway routes along the Interstate 5 corridor. However, traffic congestion is an issue as regional employment centers at Sorrento Valley, Mission Valley, Otay Mesa, Downtown, and the Golden Triangle have evolved. 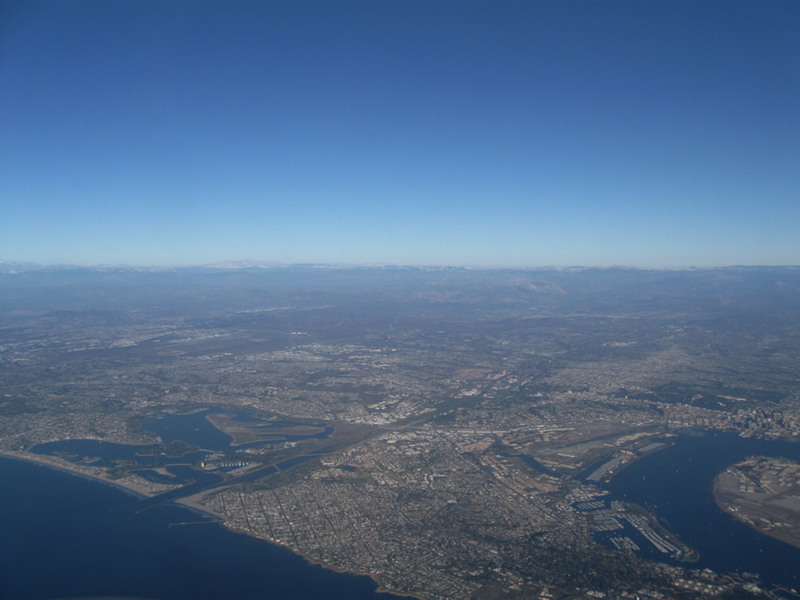 This page presents the main freeways and highways in the San Diego region, including the northern parts of San Diego County. 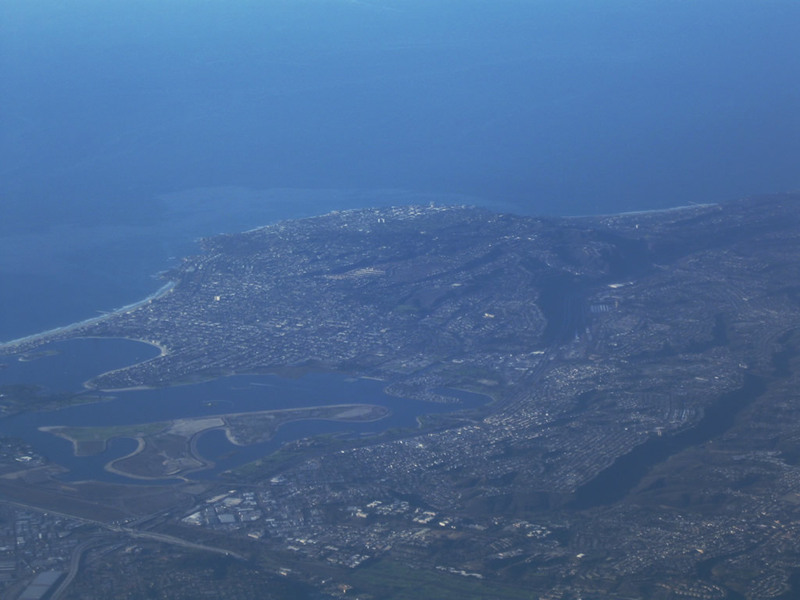 Aerial photography covering the city and county of San Diego. Photos taken 12/20/08. Interstate 5 is the San Diego Freeway, starting at the International Border at San Ysidro and extending north along the San Diego County coastline into Camp Pendleton, passing through Chula Vista, National City, downtown San Diego, Old Town, Mission Bay Park, La Jolla, Sorrento Valley, Carmel Valley, Solana Beach, Encinitas, Carlsbad, and Oceanside. Interstate 5 replaced U.S. 101 in 1964 as the primary coastal route in San Diego County, but U.S. 101 is preserved in many areas, especially northern San Diego County. Interstate 5 is one of the busiest stretches of freeway in the county, and it is eight or more lanes for its entire length. SR 79 to Imperial Co.
Interstate 8 is the region’s primary east-west route, following Old U.S. 80 from the Imperial Valley into the county near In-ko-pah, then traveling west into the city of San Diego. 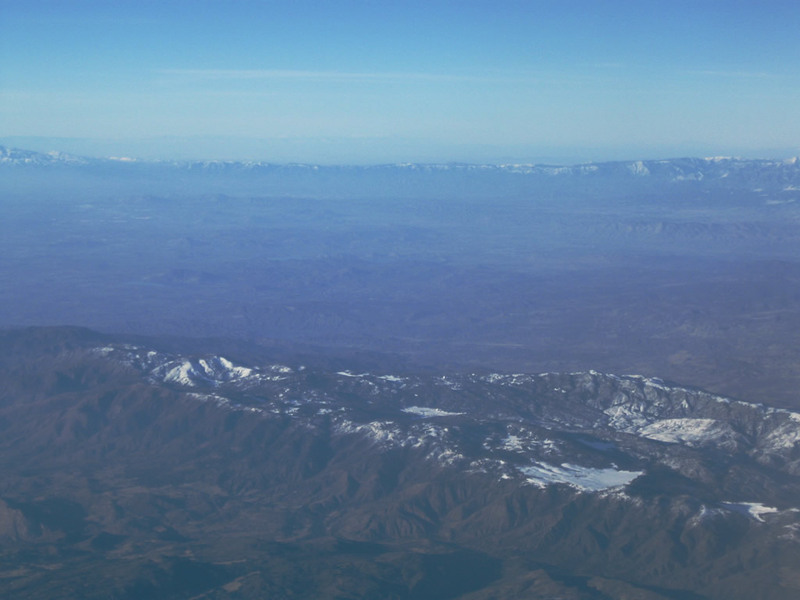 The freeway is designated as the Kumeyaay Highway (named for a local Native American tribe) and gains importance as it reaches the outer reaches of suburban areas near Alpine. Interstate 8 quickly widens into an eight-lane freeway, passing by one of the busiest stretches of freeway in the county near the Interstate 15 and Interstate 805 interchanges. The freeway ultimately concludes its run near the mouth of the San Diego River in Mission Bay Park near Ocean Beach. Interstate 15 is the Escondido Freeway (known as Avocado Highway north of Escondido), and it comes into San Diego from the Inland Empire near Temecula, and it becomes an important commuter route from the bedroom neighborhoods within Escondido, Poway, and San Diego to the jobs in Mission Valley, downtown San Diego, and Sorrento Valley. Interstate 805 is the Jacob Dekema Freeway (Inland Freeway), which provides an alternative to Interstate 5 through San Diego, National City, and Chula Vista. Completed in the 1970s, Interstate 805 has seen explosive traffic growth as a result of the expansion of the suburbs in the South Bay areas as well as new communities and businesses along the northern portion of the route, especially the high-tech businesses that have appeared in Sorrento Valley. Traffic congestion is a perennial problem on this freeway due to the locations of residences and businesses, and a managed lane project is in the works for this busy corridor. 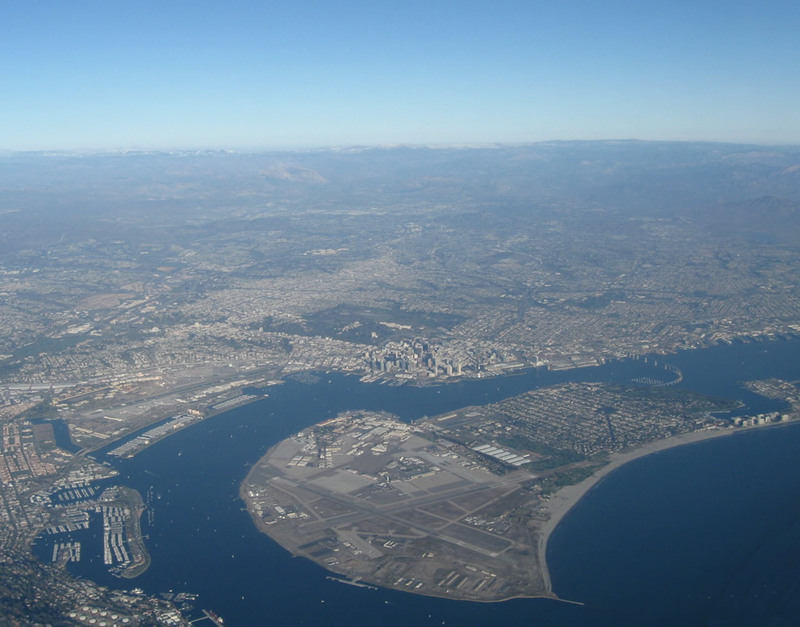 San Diego is the largest city in the United States that is not served by a single U.S. highway (other large cities not served by U.S. highways include Seattle, Washington, and Tucson, Arizona). In 1964, the state of California decommissioned many U.S. highways, and signs were removed as their freeway replacements were constructed. U.S. 80 was replaced by Interstate 8 by 1972, U.S. 101 was replaced by Interstate 5 in 1964, and U.S. 395 was replaced by Interstate 15 and California 163 by 1972. Historic route signage for all three routes has been placed, with U.S. 101 signs appearing in the late 1990s, and U.S. 80 and U.S. 395 signs appearing around 2007 and 2008. The state of California officially designated each of these former U.S. highways as historic corridors. California 11 was added to the General Plan in 1996 by the San Diego Association of Governments (SANDAG). The initial segment of the freeway stems east from California 905 (Otay Mesa Freeway) to Enrico Fermi Drive. The remainder of the planned route will extend east to a new federal Port-of-Entry (POE). This new POE will link to the Tecate-Tijuana Toll Road (Mexico 2-D) and the proposed 20-mile Tijuana beltway (known as Tijuana 2000 or Calle Dos Mil, this freeway links Mexico 2-D with the Tijuana-Ensenada Toll Road [Mexico 1-D] near Rosarito). SANDAG plans on California 11 being a toll facility. SR 52 at Clairemont Mesa Boulevard and Regents Road in San Clemente Canyon. Photo taken 10/28/04. California 52 is the Soledad Freeway, starting at Interstate 5 at the foot of Mount Soledad in Rose Canyon, passing through Soledad Canyon to form the bottom of the Golden Triangle (locally known as University Town Center or UTC) before ascending Kearny Mesa. The freeway was extended in the late 1980s and early 1990s through Mission Trails Regional Park to its current terminus at California 125 in Santee. The eastern extension from Santee to California 67 was completed on March 19, 2011. The new freeway debuted to motorists on March 29, 2011. The western segment of California 54 is the South Bay Freeway between Interstate 5 at the border between National City and Chula Vista and California 125 near Sweetwater Reservoir. With the completion of the California 125 toll road in late 2007, the section of California 54 between Woodman Road and California 125 was widened to eliminate the at-grade intersection with Sweetwater Road and to upgrade the highway to freeway standards. A separate, disconnected section of California 54 is signed in unincorporated San Diego County from California 94 north to the El Cajon city limits. This eastern segment of California 54 is a conventional highway that serves the community of Rancho San Diego. Prior to 1999, California 54 used to extend all the way to Interstate 8 via Second Street; that section is now signed as California 54 Business and is maintained by the city of El Cajon. California 56 is the Ted Williams Freeway between Interstate 5 in Carmel Valley and Interstate 15 in Rancho Peñasquitos, all within the city of San Diego. The freeway had gap in the middle that was completed in July 2004. This gap was built using federal, state, regional, city, and developer contributions. The managed lanes project reconfigured the eastern interchange with Interstate 15 in 2008, but the interchange is still signalized with sharp turns to Interstate 15. At the western end of California 56, plans call for the construction of missing freeway-to-freeway connectors with Interstate 5. These connectors are very controversial since some neighbors do not want the high-level ramps near their homes, while other neighbors do not want the connecting traffic to use the local street network. California 75 is Palm Avenue, Silver Strand Highway, Orange Avenue, and the Coronado Bay Bridge. California 76 is the San Luis Rey River Valley Expressway and Mission Boulevard. It extends across Northern San Diego County from Interstate 5 in Oceanside to California 79 southeast of Palomar Mountain via Bonsall. California 78 connects Interstate 5 in Oceanside with Interstate 15 in Escondido as a freeway, then snakes through several city streets in Escondido en route to San Pasqual Valley. The highway heads into the high country of San Diego County, passing through Ramona, Santa Ysabel, and Julian before entering the desert and Imperial County. California 94 is the Martin Luther King, Junior Freeway between downtown San Diego and California 125 in La Mesa. California 94 continues east as Campo Road to serve the backcountry of San Diego, connecting to the Tecate Port of Entry via California 188 and culminating its easterly journey at Interstate 8 near Boulevard. California 125 is eastern bypass of San Diego. The route for this freeway from Otay Mesa north to Santee has been identified, and sections of the route between California 54 and California 52 have already been completed. Controversy has prevented identification of a specific route for California 125 north of California 52, but continuing congestion on Interstate 15 has brought the concept of this freeway back to the forefront. California 163 is the Cabrillo Freeway between downtown San Diego and Interstate 15 in Kearny Mesa. The four-lane freeway passes through scenic Balboa Park before assuming an eight-lane configuration in Mission Valley. California 163 is the primary commuter route from downtown to Interstate 15. 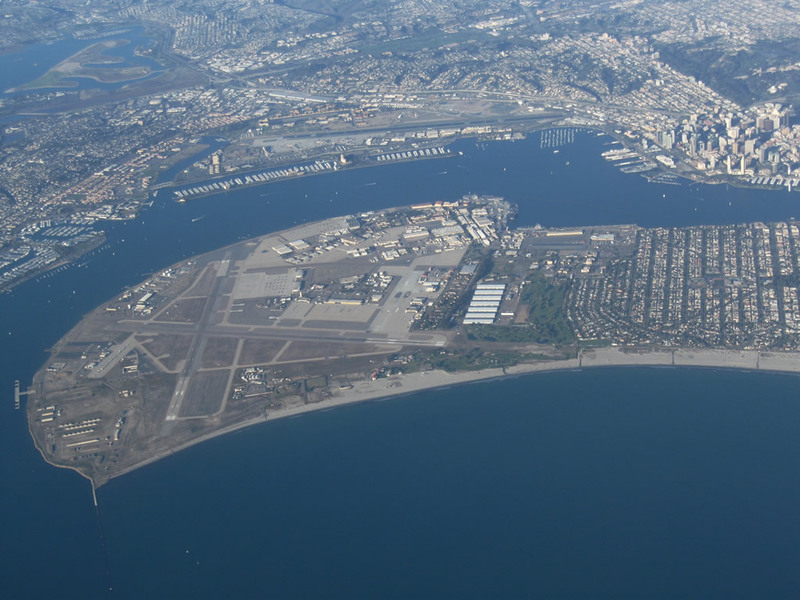 California 282 connects California 75 and the Coronado Bay Bridge with North Island Naval Air Station. California 905 is the Otay Mesa Freeway between Interstate 5 in San Ysidro and the Otay Mesa Port of Entry. The portion of this state highway between Interstate 805 and the future California 125 interchange is currently an expressway and is slated for upgrade to freeway standards; once this upgrade is complete, the entire route is slated to become Interstate 905. California 209 was Rosecrans Street, Canon Street, Catalina Boulevard, and Cabrillo Memorial Drive. It was legislatively decommissioned and accepted by the City of San Diego by May 2001. Signs and shields still remain for this route, however. California 274 was Balboa Avenue between Interstate 5 and Interstate 15. It was legislatively decommissioned and accepted by the City of San Diego by May 2001. Only a few signs and shields remain for this route, as most reassurance shields were taken down as part of a beautification project in 2005. Most intersecting freeways (I-5, I-805, California 163, I-15) still have California 274 shields on the freeway approach signs to Balboa Avenue. 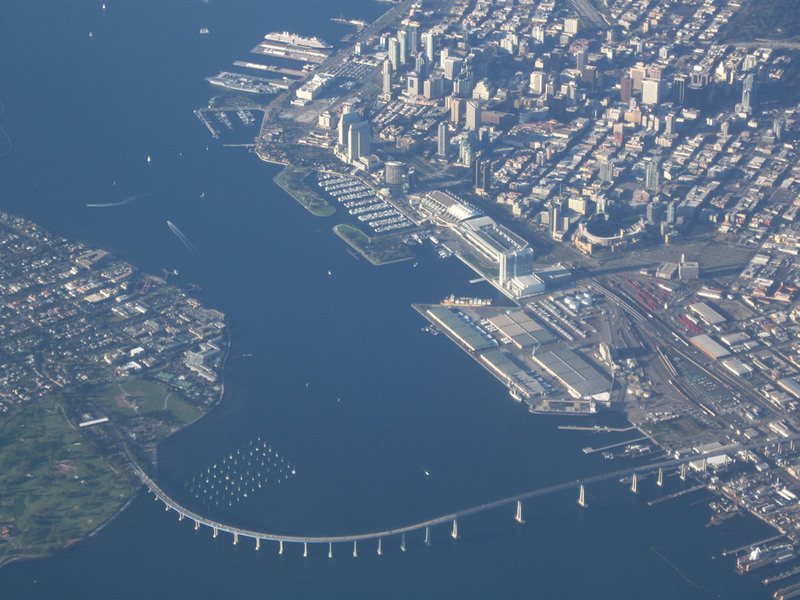 There were several freeway corridors proposed for the San Diego region that were proposed a various intervals that were deleted from planning documents prior to construction. These routes are no longer under consideration for construction at this time. 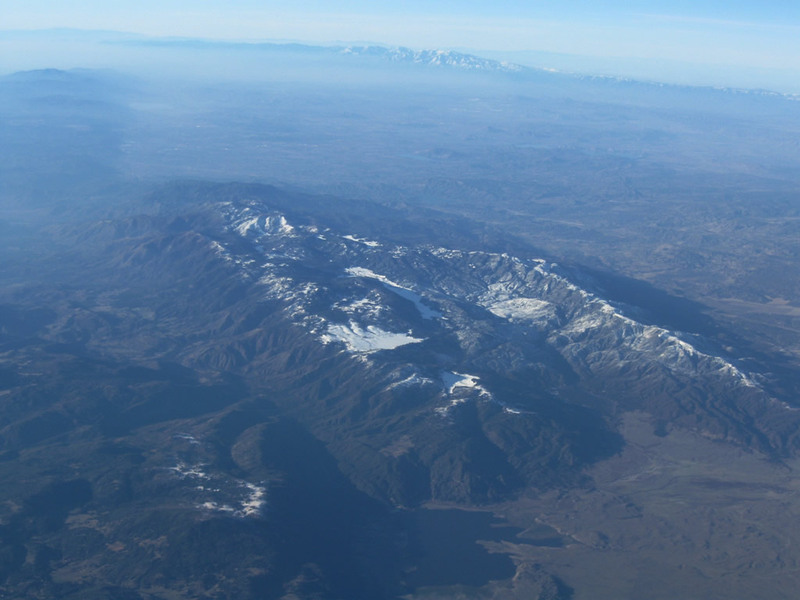 California 157, the San Miguel Freeway, was proposed to follow Paradise Valley Road between Interstate 805 and the location of the California 54/125 interchange complex at Jamacha Road. Due to local opposition, the entire freeway alignment of California 157 was deleted from both the state and SANDAG planning documents. Combined with defunct California 252 (the Southcrest or El Toyon Freeway) and Interstate 5, California 157 would have provided direct access from East San Diego County to downtown. California 157 was planned to run from Interstate 805 near Ocean View Boulevard, cut through Paradise Hills, and link up to the proposed California 125 alignment near Sweetwater Reservoir. Highway planners added the California 157 freeway to the state system in 1959, but it was rescinded locally by SANDAG in 1974. 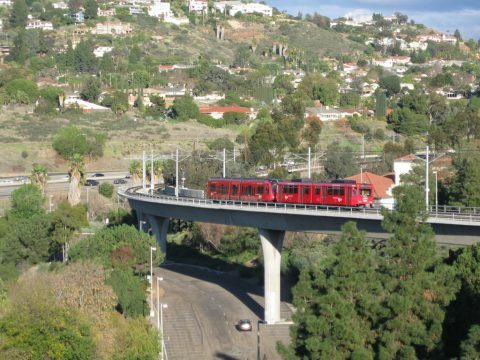 SANDAG deleted California 157 because of the “extensive residential and commercial development in the western portion of the corridor.” The right-of-way purchased for the eastern portion of the route was sold in the mid-1970s. It took another twenty years for the route to be deleted from the state log. California 171, the Switzer Canyon Freeway, was part of a road system first proposed in 1926. The route would have started at Interstate 5 near downtown San Diego at the current Pershing Drive/B Street interchange, and ran northeast to connect with Interstate 805 near the Interstate 8 junction in Mission Valley. California 171 would have crossed several canyons, residential areas, the community of North Park, and the Balboa Park Municipal Golf Course. Local neighborhood opposition stopped this freeway fairly early, but it was not deleted from the proposed state system until 1993. A remnant of what was to be a freeway-to-freeway connection exists at the Interstate 5 and Pershing Drive/B Street interchange. SR 252, the Southcrest (El Toyon) Freeway, was planned to run from the Interstate 5 / SR 15 interchange complex southeast to Interstate 805 at the 43rd Street exit. With plans nixed in 1980, the huge flyover and approach ramps at the 43rd Street exit represent the east end of this planned freeway. A redevelopment project later resulted in an Albertson’s (originally Lucky’s) grocery store at the terminus of the off-ramp. Several widened bridges and ramps at the interchange joining Interstate 15 and SR 15 represent planned connections with the unbuilt SR 252 freeway. SR 252 was planned to handle an average of 90,000 vehicles per day. It was supposed to act as the north end of an Interstate 5 bypass around National City and Chula Vista, utilizing Interstate 805. Commuters from the communities of Eastlake, Bonita, and Paradise Hills now must instead either SR 54 or SR 94 to make their commute to downtown without using urban streets. This, in turn, has impacted the traffic flow on both Interstates 5 and 805. The SR 252 ramps on Interstate 805 were built around 1974-75, long before the rest of the SR 252 project would have been started. When work finally commenced, there was already significant community opposition. With several freeways already in place at the time, the community felt that it was being cut up into pieces. Subsequent alternatives previously considered included construction of a new surface street called Martin Luther King Blvd, and talk of tunneling. But in the end Caltrans relented and canceled the project. Aside from the defunct U.S. routes (80, 101, and 395), a few state routes were renumbered over the years. California 103 is the former designation for Interstate 15 along what was Wabash Boulevard, 40th Street, and Murphy Canyon Road between Interstate 5 and California 163. Wabash Boulevard was originally a city-constructed expressway, but it was handed over to state control at one point. California 109 was the planned state sign route for the Ocean Beach Freeway (now known as Interstate 8 west of Interstate 5). This short freeway would follow the San Diego River between Sunset Cliffs Blvd (where it meets Nimitz Boulevard) and the junction with Interstate 5, Interstate 8, and Former California 209. At the time it was planned, it was also submitted to be part of the Interstate Highway System. The Ocean Beach Freeway was constructed in the 1960s, and it may have been signed briefly as California 109. However, only a short time later, California 109 was streamlined into Interstate 8. Interstate 8, which had previously been designated to run from Interstate 5 east to Arizona, was extended west to the Sunset Cliffs intersection – Nimitz Boulevard intersection. Hence, Interstate 8 now ends at the Sunset Cliffs stoplight rather than the massive Interstate 5 – California 209 interchange. California 117 was the designation along Otay Mesa Road/Freeway in the late 1970s and early 1980s. This is now California 905. Page Updated June 17, 2009.